The 7th round brought only minor changes to the overall picture. The leader remained the same. The main drama of the round occurred in Kamsky’s game – the American missed an easy win against Karjakin and did not manage to make the first time control. Chess is brutal. It punishes you for every slight mistake you make. You can play most of the game brilliantly, and then lose concentration for a move or two – and it’s over. You are knocked out, like in boxing. I feel sorry for Kamsky. As a chess player, I understand very well how hard a blow it was for him. Gata excellently handled the Winawer Variation of the French, employed an interesting scheme with the knight on d5 (earlier Black always put the knight to f5). 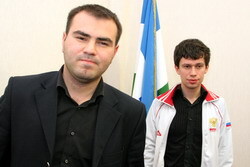 Probably this is one of the lines prepared for the match against Topalov. After White captured the f7-pawn, Black’s pieces occupied excellent squares and began to bother the White king. Karjakin’s counterplay started with 21.a4 was probably the best practical chance in a difficult situation. The only thing he could do was to put the pressure on the opponent and force him to calculate a lot. I will not list here all the winning moves for Black. It is enough to point out the simple 27…Qxc2!, which could decide the game in a few moves. In the mutual time trouble Sergey acted quicker and more accurate – and Gata miscalculated, ended up in a lost position, and lost on time. Boris played a bit too creatively today. His opening was extremely non-standard: White completely gave up the center to the opponent. The notorious two bishop advantage was unimportant. 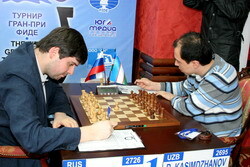 Moreover, after Pavel stabilized the pawn structure (16…Bxc6!, 18…c4!) it turned out that Black’s knights are simply stronger than White’s bishops. The dark-squared bishop was in a particularly poor shape. Gelfand could free it only by sacrificing a pawn, which he did, and immediately traded the poor bishop. It proved to be the decisive error! Instead of 30.Bxe5? much stronger was 30.Bxe4!, and after 30…Rxd4 (30…dxe4? 31.Bxe5!) 31.Bg2 Nc6 32.e3 White gets certain compensation for a pawn. Having exchanged the wrong bishop, Boris soon took a remote and unneeded pawn on a7, missing the opponent’s winning strike – 31…Nxf2! Black carried out a nice and simple combination and won the game. Evgeny’s strategy for today’s game was quite tricky. In the Pirc Defense he abstained from the sharpest lines, forcing his creative and aggressive opponent to play a slow, maneuvering game. After Black somewhat weakened his position, Alekseev began to play on the light squares (18.Nb2!, 19.a4, 26.Bf1!) and got a significant advantage. However, he didn’t play his best at the technical stage. Prior to the control he missed the best continuation 39.Kc4! (instead of 39.Kd2), and Black replied with 39…e4!, which forced exchanges and allowed Black to survive. This was another dull Marshall draw with White having an extra pawn against Black’s powerful bishop pair. One can notice Black’s novelty 23…h5 – the idea of advancing the h-pawn is very popular these days. I even thought that Black could play for a win by sacrificing an exchange: 26…Rxe3!? The exchanges that followed gave White some advantage, but Bacrot did not search for small edges and accepted the move repetition. Even short draws of the Russian champion are stylish. Mere mortals would never consider sacrificing a pawn on the 14th move, preferring to improve the position and wait for better spots. Svidler’s sacrifice destroyed the center, secured an excellent d4-square for White’s pieces and eventually gave White a draw from the position of strength. The final position of the game is indeed completely even. None of the players can be proud of this game. Leko wrongly provoked the opponent’s activity on the queenside by 15…Bb4. 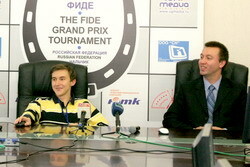 Ivanchuk happily accepted the invitation, rolled his pawns forward and won a pawn. Converting it wasn’t easy, but White could certainly play much better. He could try trading rooks by 35.Ra8, then bring the queen to c6 and the knight to d5, and start moving pawns. However, Vassily missed 38…Bb3!, and although he kept the material advantage, he could no longer create any real problems for the opponent. Logical simplifications led to a draw. In this game both players for many moves followed a relatively unknown game, repeating even the less obvious moves. I thought that after 20.Rxh4 Rhd8 21.Qb4 White has a clear and comfortable advantage, although the move in the game is not bad either. 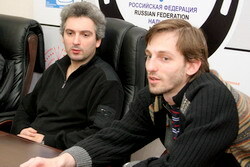 Grischuk’s novelty 22.Bh3 was good – I was unable to find a clear-cut way to equalize for Black. Akopian rushed to trade queens in order to release tension around his king, which cost him a pawn. 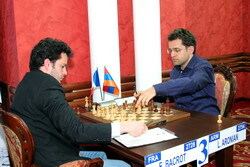 However, the Armenian saved this endgame with tenacious and very accurate defense. White’s last chance to play for a win was 33.h5!, while the rook invasion to the 7th rank gave Black time to create the saving counterplay.